The Giants won’t lose this week. That’s not a bold prediction or and it’s not me thinking a team with one win this season and four wins since the start of last season is going to win a game, rather it’s simply a fact. The Giants won’t lose this week because they aren’t playing. This week will be what it feels like if the Giants seized to exist and I’m guessing it will feel really good. There won’t be disappointment or frustration or heartbreak or anger. There won’t be Eli Manning having less than a second to release the ball and there won’t be Manning getting knocked into next week when the offensive line has yet another breakdown. There won’t be Saquon Barkley having nowhere to go five yards behind the line of scrimmage or the constant one-yard checkdowns to the team’s best player. There won’t be Odell Beckham having a huge game statistically in a loss then calling out his team as if he’s not part of the problem. There won’t be Sterling Shepard or Evan Engram having drops at big moments in the game. There won’t be the defense bending and not breaking all game until the final minutes when it looks like the Giants might come back. There won’t be Pat Shurmur having no idea what to do when his team gets into the red zone or calling for unwinnable challenges or giving up points for fourth-down attempts. There won’t be any of the nonsense that has gone on for the last 24 games, which has caused me to wonder if the New York Football Giants are now the Cleveland Browns. The Giants might not be exactly the Browns, but they are pretty freakin’ close. The Browns have one more win and a tie than the Giants this season and no other team in the league is close to the two over the last season and a half. The teams after the Giants in those standings are either rebuilding, playing a rookie quarterback or recently won a Super Bowl and have a grace period. The Giants don’t fall into any of those three categories. They are just a bad team headed for the top of the draft despite not being in rebuilding mode. The Giants continue to be a losing team with no plan in place to restore winning. This season was supposed to be different. A new general manager and a new coach and a new offensive line were supposed to remove the bad taste that Jerry Reese, Ben McAdoo and the 2017 season left in Giants fans mouths. But this season has been worse. The 2017 Giants could use the injury excuse as Manning was throwing to no-name receivers for most of the season and the defense was missing big names a majority of the time. The 2018 Giants? They have been mostly healthy, have had Beckham and Shepard all season and added Barkley. Yet somehow they are worse than the team which won three games a year ago. I didn’t think that was possible. I felt good about the Giants this season, and in Week 1, despite the loss, I came away with the positive idea that a three-win team from a year ago could go toe-to-toe with the AFC runner-up. After Week 2, I was demoralized, and could see the Giants’ season spiraling out of control. The loss in Dallas was the single-worst performance I had maybe ever seen by a Giants team in my lifetime and the team was once again 0-2 with their season on life support. Week 3 provided an unfavorable matchup against a quarterback who can run and a pass rush that hadn’t displayed their abilities, but the Giants magically came out of Houston with a win. The feelings after the Dallas loss had been erased and chalked up as a bad performance and I could see the Giants going on a run. Instead, they gave away another winnable game, this time at home against the Saints to fall to 1-3. It was a disheartening loss, but the season could still be saved. Then in Week 5, the Giants pulled off a late-game comeback to take a one-point lead on the Panthers. As I started to think about the weeks ahead and planning the Giants’ path to winning the NFC East, Graham Gano drilled a game-winning 63-yard field goal as time expired. It was as crushing as any regular-season loss could be, but the rest of the division was letting the Giants hang around at 1-4 and a Thursday night home game against the Eagles could put the Giants one game back in the sloppy NFC East. Normally, the home team has an incredible advantage for the short-week Thursday game. Not the Giants. The Giants were flat-out embarrassed at home, losing by three touchdowns, and finally showing even the most optimistic Giants fans that this season is just a continuation of last. The Giants had 11 days until their next game, which gave them just enough time to come up with a new and different way to lose a game, and against a Falcons team, which can’t stop anyone, the Giants scored three points in the first half and six points through three quarters. 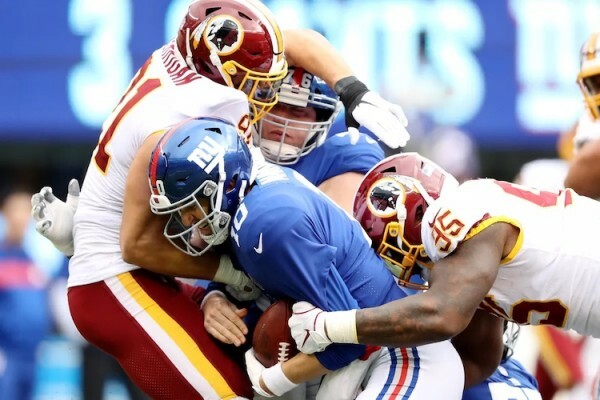 Then this past week, the Giants scored three points in the first half at home against the Redskins and still had only three points on the board through three quarters. I’m not sure people understand how incredible it is to be held to three points in a half in an NFL game in 2018. The league has done everything it can to increase scoring and essentially make it impossible to play defense and the Giants still can’t score. The Giants have been held scoreless in eight of the 32 quarters (25 percent) they have played. They have scored three points or less in 12 of 32 quarters (38 percent) and have seven points or less at halftime in six of their eight games (75 percent). Most of their scoring has come in the fourth quarter with the game already out of hand and the opposition trading yards for time on the clock. The only time the Giants have had more than 16 points after three quarters was in their Week 3 win in Houston when they had 20. Their point totals through three quarters in their games: 9, 3, 20, 10, 16, 13, 6, 3. I’m not sure where the Giants go from here. Ideally, they would use their near-top-of-the-draft pick on either a quarterback or offensive lineman and the following picks on those same things. Unfortunately, there’s no guarantee that will happen with a front office that saw the 2017 Giants and their 3-13 record and thought they could be a playoff team in 2018 with the addition of a running back and a rookie offensive lineman and without a pass rush. It’s depressing to realize the next meaningful Giants game will be Week 1 next September, nearly 10 months away. While nearly the rest of the league and the rest of fans have a reason to get excited for Sunday (or Monday or Thursday), I’m relegated to gambling and fantasy with no real football to care about. It’s not a place I thought I would be in when the season began, but it’s a place I have grown accustomed to as a Giants fan.